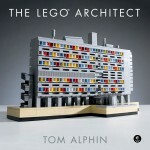 Tom Alphin is the author of the bestselling new book, The LEGO Architect. The book explores 7 common architectural styles using photos of amazing LEGO creations, a brief history of each style, and instructions to build your own LEGO models in each architectural style! One of the goals of my 30-day Lego challenge is to build some of the models outside of my home. Even at home, it is important to have an easy way to pick up my bricks after a building session, as we don’t have a very big house. This requires an efficient system to carry my bricks and ensure that none of them get lost. A lot of adult Lego builders sort their bricks before they start building. They might be sorted by color or by size, and in the extreme case every unique color and part would be stored separately. In my case, I like to sort them into groups of related bricks, but don’t need each and every type of brick in a separate bag, bin, drawer or pile. The Lego Architecture Studio set comes with two clear sorting trays, three small sorting boxes, and the main box is a reasonable size to carry. I like that they tried to include brick storage as part of the design of this set, but I quickly decided that the included sorting options are inadequate for my needs. Neither the small boxes or sorting trays have lids, so you can’t expect the pieces to stay in place on the go. I also don’t feel like there are enough containers included with the set to sort the bricks into small enough groups to support my style of building. Instead, I have found it much easier to ignore the included boxes and trays. I have sorted the bricks into about ten different quart-sized ziploc bags. 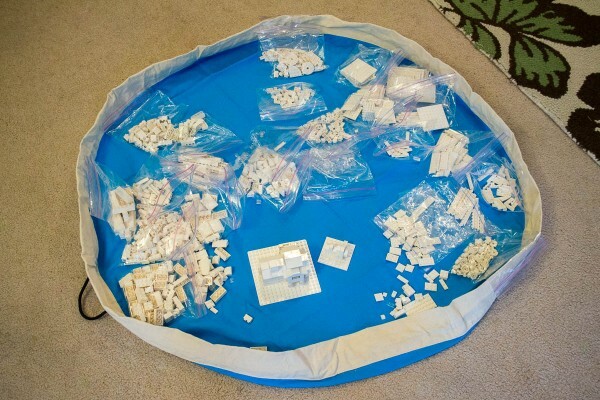 Separate bags include short bricks, long bricks, the wide bricks, small plates, large plates, specialty connectors, and clear bricks. (ex: One of my bags contains just the 1×1, 1×2, 1×3 and 1×4 bricks.) This way, I can grab the bags which are relevant to the project I’m building, let them spill out into small mounds, and shove them back into their bags when I’m done. My original plan was to carry all the bricks in the original box, but I decided that needed a better solution since the cardboard box is bulky and fragile. I considered a couple ideas, such as a single plastic tub with lid, a plastic hobby box with many small compartments or a canvas bag with a lid or zipper. 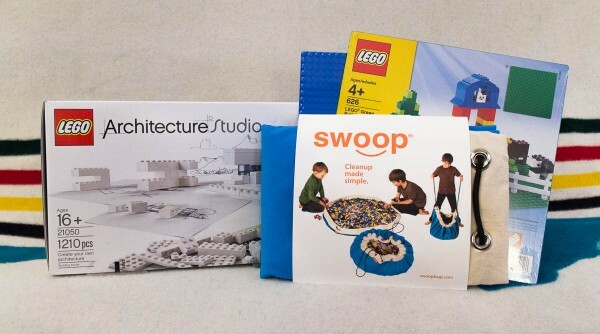 Building my Second Lego Challenge inside my large Swoop bag. In the end, I was drawn to the large Swoop bag original which I had seen online, but finally got a chance to see in person at the Seattle BrickCon convention. These “bags” open flat so you can spread everything out and build Lego models right inside the canvas bag. It is sewn to include a small lip that keeps the pieces inside when the bag is laid flat. When you are done, you can pull the drawstring to clean everything up, knowing that you didn’t leave any bricks behind. (even if you keep most of your bricks in smaller bags, you sometimes miss one.) The bags are made right here in Seattle out of a durable Canvas fabric in your choice of twelve colors. I’ve used this setup for my project so far, and it has worked great in the living room while watching TV, and was easy to pick up and move when we had friends coming over for a party. I think it will work great for traveling projects, such as my planned Lego Challenge trip to the Seattle Central Library. 1210 Lego bricks included in the Lego Architecture Studio set. Lego baseplates in a variety of colors. A white 16×16 baseplate has been particularly useful. Even though my Lego 30-day challenge is to use only the bricks in the Lego Architecture Studio set, I expect to augment my traveling kit with additional basic bricks, some hinges, and additional accent pieces after I complete my 30-day challenge. I also have this set and have been free building with my kids. The storage is a bit of a problem and yes, I do appreciate the small boxes inside. We build inside on a large table with a cloth on it to keep parts from roling away. I will go read the rest, it gives me new ideas to build and let the kids see other builds. Thanks for the fun read and for the Brick Blogger for highlighting your blog.